Outdoor living areas are quickly growing in popularity and so follows the need for more sophisticated looks in outdoor furniture and area rugs. 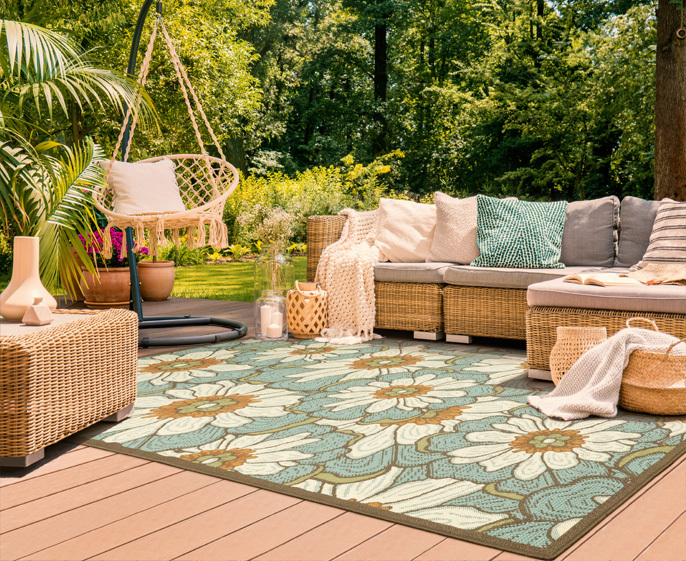 With over 200 outdoor friendly rugs to choose from, our selection provides a style and coloration for every customer from very simple traditional borders and textures to more globally inspired medallions and vibrantly colored florals. Textural and subtly colored graphic patterns, such as chevrons and tilework motifs, also coordinate well with many outdoor furniture and fabric groupings. It’s also very important to note that due to the versatility of our collections, while we label them as outdoor, they are often being used inside the home as well.